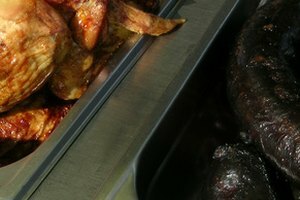 Chicken is a versatile and popular food used in a variety of dishes and cuisines from around the world. 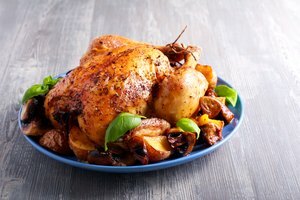 A roasted chicken is easily served along with a few side dishes for a wholesome weeknight meal, or to celebrate a special occasion. Using the proper method, you can impress your family and friends by serving a moist, juicy and flavorful roasted chicken. Remove the chicken from any packaging, then reach into the body cavity to remove the giblets which are usually wrapped in a cloth bag. Either discard the giblets or set aside for another use, such as for making gravy. Check to see if the chicken’s kidneys are still in place. Look in the abdominal cavity of the chicken. If you see dark red masses, remove them with your fingers and discard them. Rinse the chicken under cold tap water to remove any feathers or other debris, then pat the chicken dry using a cloth towel. Make sure to thoroughly dry the chicken to ensure the bird browns evenly when roasted. Set a wire rack in a shallow roasting pan, then set the chicken on the rack. Use butter or olive oil to grease the skin of the chicken to keep it moist during the roasting process. Season the chicken using salt, pepper and herbs of your choice. Rosemary, tarragon, thyme and sage are all recommended. You can also place some herbs, fruits or vegetables into the body cavity of the chicken for additional flavor. Insert an oven-safe thermometer into the thickest part of the thigh, being careful to not touch the bone. Place the roasting pan on the middle rack of the oven. Baste the chicken every 20 minutes by removing the roasting pan from the oven and using a baster or a spoon to coat the bird with any drippings that have accumulated in the pan. Doing so ensures a moist chicken. Remove the chicken from the oven after roasting for approximately 3 hours, or until the meat thermometer registers 180 degrees F.
Place the chicken on a cutting board and allow the meat the rest for 20 minutes before carving and serving. Roast a chicken for 20 minutes per pound, plus 20 minutes. If you don’t have a meat thermometer, pierce the chicken’s leg with a fork. If the juices run clear, the meat is done roasting. Raw poultry can contaminate surfaces and other foods with bacteria. Be sure to clean all surfaces with antibacterial soap and use separate utensils for handling the raw chicken and other food items.